Posted July 2, 2018 by The Rapid & filed under Places to Go. 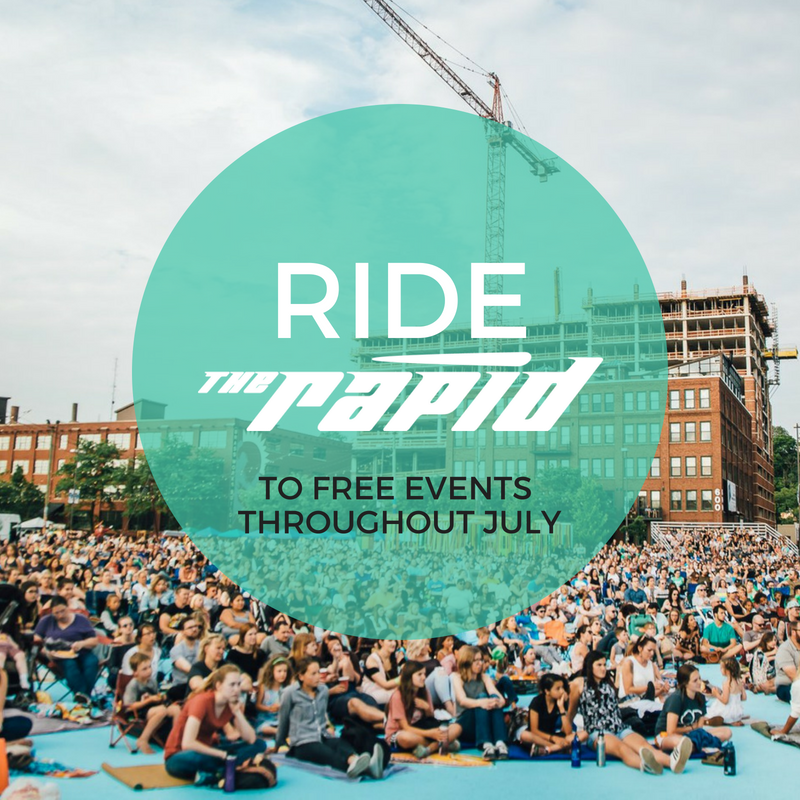 Summer is here and there are so many free events taking place throughout the six cities served by The Rapid! Michigan summers are the perfect time for exploration, new activities and, most importantly, fun! Movies on Monroe, formerly Movies in the Park, is the free outdoor film series presented by Downtown Grand Rapids Inc. Visit 555 Monroe Ave NW on takes place on July 6th and July 20th to catch back-to-back movies. July’s feature movies include Major Payne, Saving Private Ryan, West Side Story and The Shape of Water. DASH right to the event and don’t forget your blanket, chairs and snacks! Check out the full lineup here for other movies playing this summer. Ride DASH and Route 11 and 7 to get to this event. On July 6th, ride Route 7 to Blandford Nature Center to get an up-close view of animals and nature. From 10:30 a.m. – 12 p.m., enjoy all that Blandford has to offer for free! Come to see the owls, hike the trails or visit the farm all without charge. Route 7 can get you to the entrance of Blandford Nature Center. Shop the Vintage Street Market: Grand Rapids’ only monthly vintage market on July 8th at the Downtown Market. Whether you’re looking for that perfect couture vintage dress or a hand-painted vintage sideboard, the Vintage Street Market is where you’ll find that exciting treasure to complete your collection. Ride Route 1, 2, 5, and the Silver Line to get you to the Downtown Market. Don’t miss the popular summer concert series that takes place at Lamar Park. This month, you can groove to Delilah DeWylde and Adams Family in a free, fun, family-friendly setting. There will be themed nights, giveaways and a variety of activities to accompany these performances. All concerts start at 7 p.m. Learn more here. Ride Route 24 to get to Lamar Park. On July 12th, 19th and 26th ride Routes 2 and 44 to Kentwood City Hall for live music from 7 – 8:30 p.m for the Kentwood City Summer Entertainment Series. This month, listen to Big Dudee Roo, The Moxie Strings and The Crane Wives while enjoying dinner from food trucks. Grab your blanket or a chair for some Thursday evening fun. Route 2, 44 can get you to Kentwood City Hall. Every week, the City of Grand Rapids Parks and Recreation Department offers a variety of free fitnesses classes taking place throughout downtown Grand Rapids. This program is a joint effort through Downtown Grand Rapids Inc. and the City of Grand Rapids Parks & Recreation Department. Free, no-registration classes include Zumba, Tai Chi, yoga and more. Classes take place at Rosa Parks Circle, the Blue Bridge, Sixth Street Bridge, Rapid Central Station and more! View all classes, dates and times here. Routes 1, 2, 3, 4, 5, 6+ can get you to fitness classes throughout Grand Rapids. For those living in the Walker and Standale area, don’t miss the free evenings of fun at Walker Community Park on July 12th and July 26th. Check out Straight Shot and the Kari Lynch Band and grab some pizza. Music starts playing at 6:30 p.m. and the fun lasts until 8:30 p.m. Ride Routes 12 and 50 to get there, pack a picnic and enjoy a beautiful evening with local tunes! Route 12, 50 can get you to Walker Community Park! Rock the park with Maranda at East Kentwood High School from 12 p.m. – 2 p.m. on Thursday, July 19. This family-friendly free event is the perfect chance to get out and enjoy the beautiful July weather. There will be a variety of activities, games and prizes for kids to enjoy. The Rapid will have a bus there and coloring books for you to check out, as well! Route 4 can get you to the park party. Every Tuesday in July, visit Rosa Parks Circle for free lunchtime entertainment. This season, Downtown Grand Rapids Inc. will once again be highlighting a diverse lineup of local bands and large games to play like chess, shuffleboard and Jenga. Upcoming musicians include Watching The Foxes, Phillip-Michael Scales, Avalon Cutts-Jones and Desmond Jones. The food trucks include Gettin’ Fresh, What The Truck and Daddy Pete’s BBQ. Routes 6, 9, 11, 13 and the Silver Line can get you to Rosa Parks Circle. You can also hop on board a DASH route. The Rapid (Interurban Transit Partnership) is the authority that provides a variety of public transportation services for the Grand Rapids metro area and beyond. It is organized and operates under Michigan Public Act 196 of 1986. Here you can find the latest news and stories from The Rapid. For more information, connect with us on other social media communities. Do you have a fun or interesting story to share about riding The Rapid? We want to hear from you.